I feel like the week before Thanksgiving everyone goes crazy trying to entertain anyone who won’t be eating with them on the Sunday/Monday holiday. Why not take some of the load off the entertainer and bring these elegant little sandwiches with you to your next gathering? Plus these are all kinds of fancy with very little effort required. It’s all in the artistic garnish, trust me. 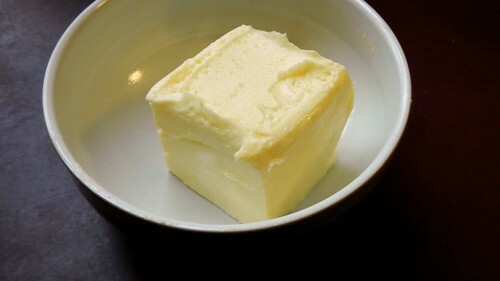 Start with 1/2 cup softened butter. Season that pat o’buttery goodness with all the salt and pepper your little heart desires. To be extra fancy we used a special pepper Teedz brought back from Cambodia. OooooooOOOOH … (I would be more pretentious if I could, but there’s only so much I can do). 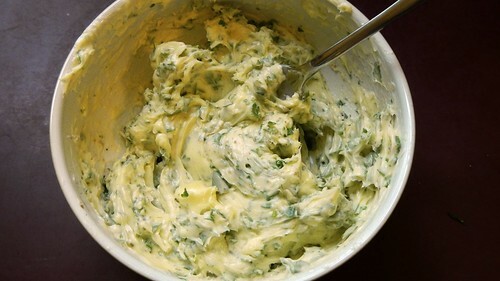 Chop up 1/4 to 1/2 cup fresh flat-leaved parsley and huck that over the butter. Give that a grand good stirring. 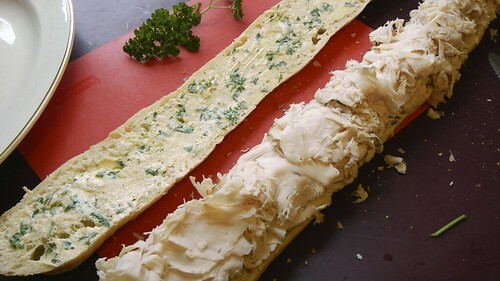 Now, take a baguette and slice it in half along its length (you know, like you were making a sandwich). 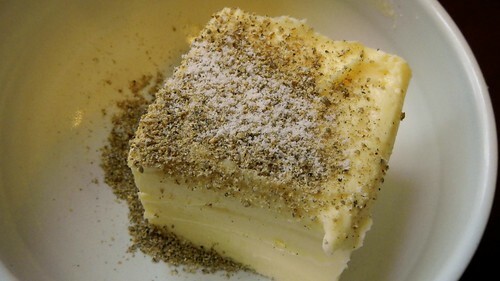 Smear both cut sides with all that glorious butter. 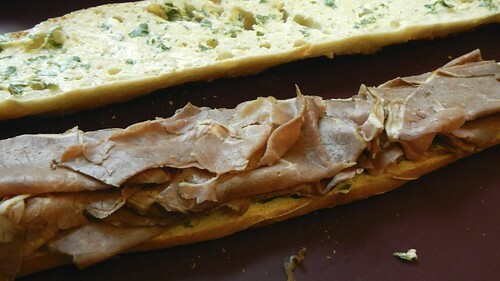 On the bottom cut side, layer on 1lb/500g of deli sliced roast beef (or 1/2lb if you are feeling health conscious but I think the sheer amount of meat on these puppies is part of their charm). 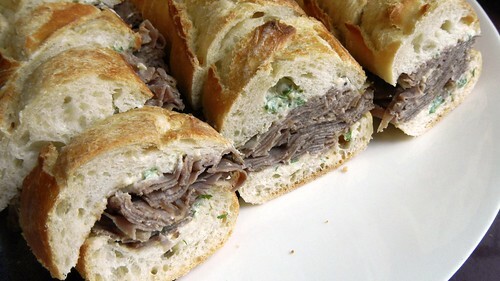 Plop the top on and start slicing up your baguette into 1 1/2″ segments. Pop those onto a nice plate. Like one with a giant WHALE on it. That would be ideal. 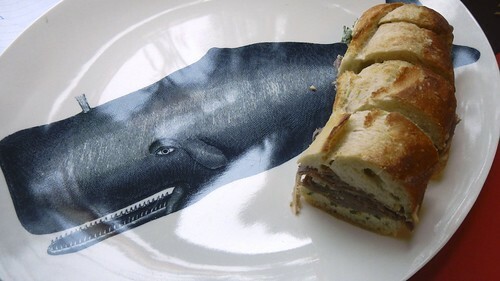 If you don’t have a whale plate, maybe you should get one. I mean, really. Who doesn’t have a whale plate? 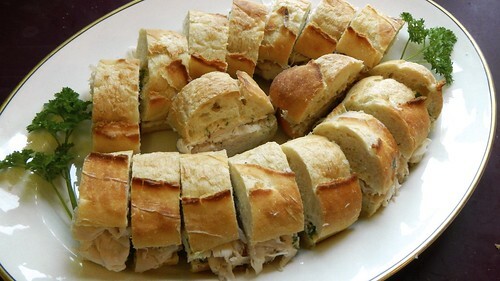 I also did another baguette, but this one was filled with turkey and it was AWESOME. 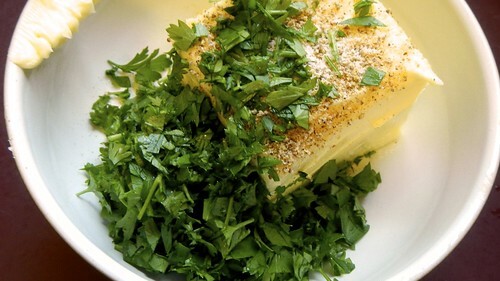 Garnish your plates with some artfully arranged fresh parsley and you’re good to go. Both plates disappeared within two hours at our little shindig, so I guarantee they will please any palette! You may not like this sandwich. It’s a bit of an acquired taste. It’s also freaking weird. But bear with me. It’s really good once you get past the weirdness. 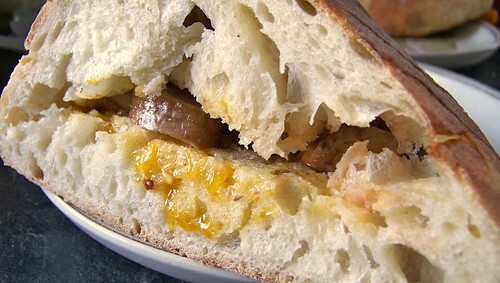 So this sandwich is actually a family recipe that goes back a few generations, to one set of the great-grands on my mother’s side. Maybe even back to Scotland. Hard to say. Origins shrouded in mystery and all that jazz. 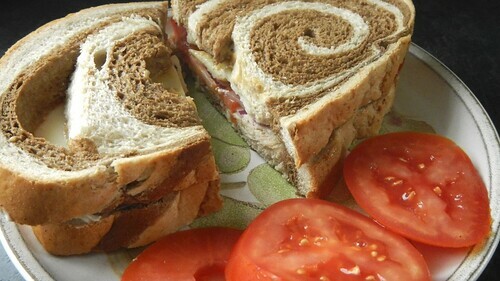 Legend has it that my mother made this sandwich for my father as a token of her love back when they were first together. She packed it into his lunch and sent him off on his day. When he discovered this — thing — in his lunch he was absolutely horrified. My mother was offended that he would be disgusted by such a beautiful sandwich. Forty years later, it’s one of my dad’s favourites. So first you take some rye bread. I like the swirly stuff, which is pretty mild but you can get a hint of the rye. My parents prefer the super dense stuff that slices about a centimetre thick. On one slice of bread, spread some nice mayonnaise. On the other slice, some peanut butter. Crunchy is best, but we have smooth on hand for Papa John so that’s what is on offer. Don’t worry, it’s gonna get weirder. 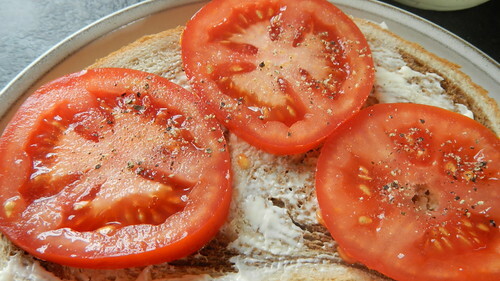 Slice up a tomato and slide that onto a slice of rye. Garnish with salt and pepper. 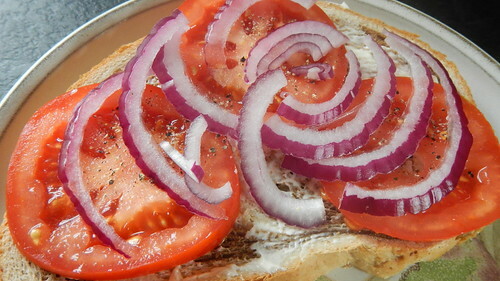 Add a few pieces of red onion (I usually forego this part but I’m sticking with tradition here, just for you). 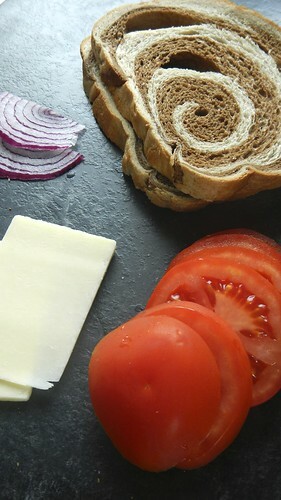 Then a few thin slices of cheddar cheese. The cheese, like the onion, is optional. 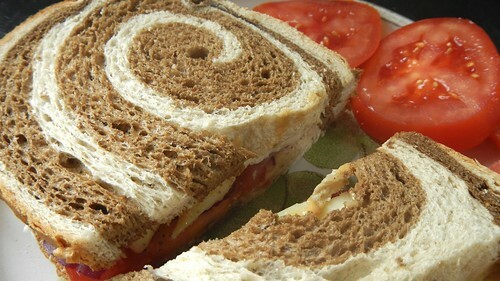 The main essence of the sandwich is mayo, peanut butter, and tomato on rye. But I like it with cheese. And that’s the sandwich. I know it seems rather icky, but if you are on the lookout for something a little bit different, I suggest you give it a try. 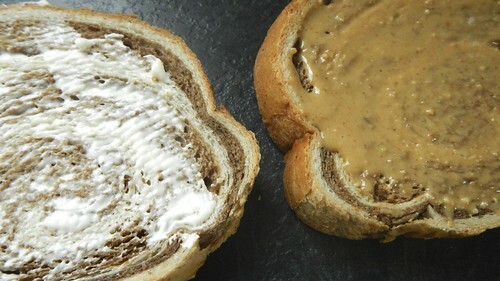 The combination of tangy mayo with crunchy earthy peanut butter, the burst of flavour from a good tomato on the faint bitterness of rye is actually quite good. Give it a shot, I dare you. 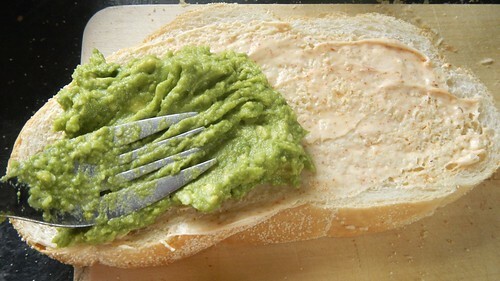 What’s your favourite weird sandwich? I love taking classic dishes and putting a little something extra in them to add just that little bit more to their perfection. And there is nothing more perfect than the classic BLT (that’s a bacon, lettuce, and tomato sandwich, for those few of you uninitiated). But is that actually true? No. Because you can always add. There’s the BELT, for instance: bacon, egg, lettuce, tomato (on a biscuit, no less). And a variation of the grilled cheese that we like around these parts, the BTC (bacon, tomato, cheese). 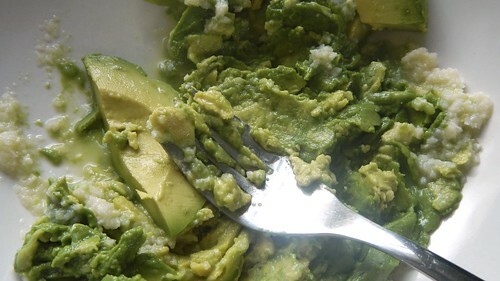 As I have learned, adding avocado makes pretty much ANYTHING better. 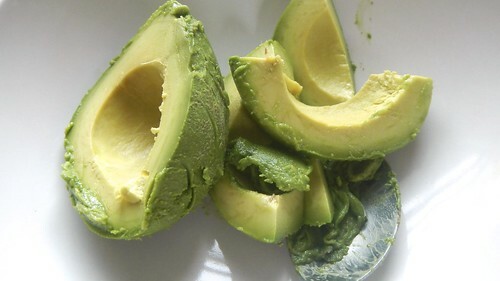 In fact, I think I’m going to make a decree here for the Avocado Rule, which parallels the Pie’s Banana Rule, wherein adding a banana to anything (shakes, smoothies, pies) makes it better. So this one is the same rule, but, you know, with avocados. 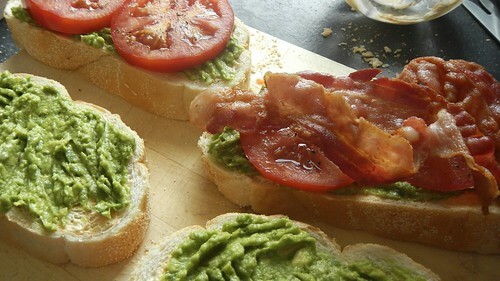 So we’re making a BALT (bacon-avocado-lettuce-tomato). We don’t do a lot of sandwiches here at Ali Does It, but with the Pie away for the weekend it’s all I can really muster up the energy for. This sandwich is at the high end of my give-a-crap level for the next few days. So stand back in awe. 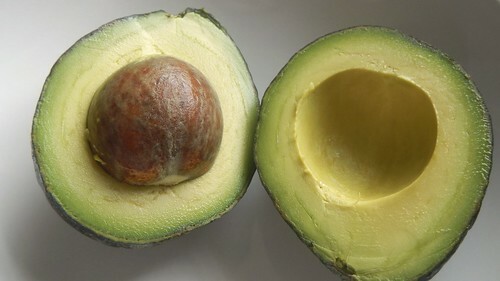 First you take a nice ripe avocado. And you cut it open. And you get rid of the pit. And you empty it into a bowl. I know, this is heady stuff. And you mash it up with some garlic and some lime juice. 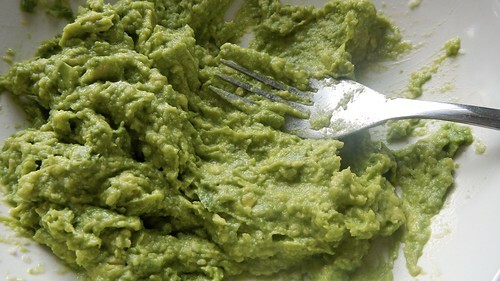 Until you have a marvellous guacamole. 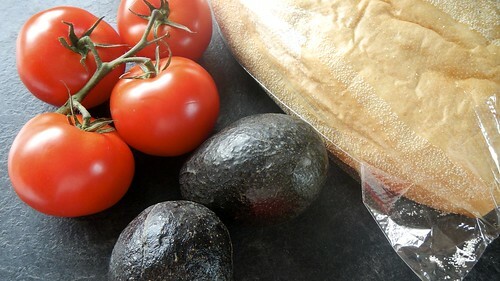 I would use a whole avocado for one sandwich but the Pie doesn’t let me so I would recommend one avocado for TWO sandwiches. Leave that alone for a bit. Then you take a couple teaspoons of mayonnaise (whatever kind you want, it’s your sammich), and add a sprinkle or two of chipotle seasoning. Give that a stir. Tada. 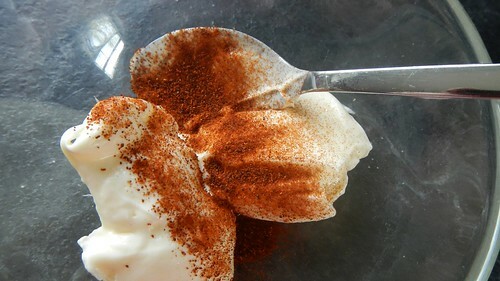 Now you have chipotle mayo. CAN YOU EVEN HANDLE IT? Me neither. 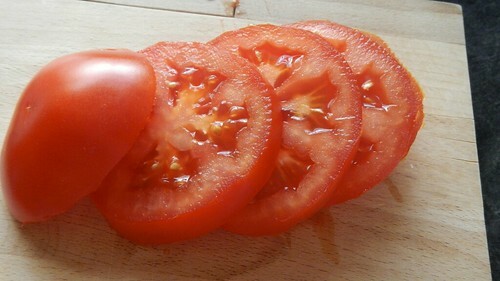 Slice up a tomato while you’re at it. And wash and dry some lettuce. Now you need some bacon. However much you want, cooked however you like it. 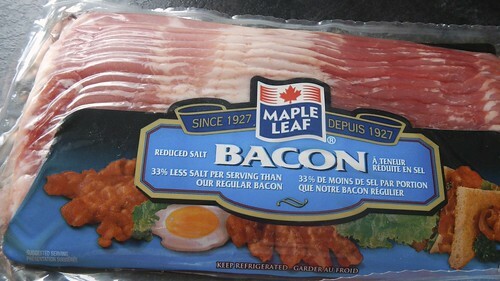 I would recommend at least two slices of bacon per sandwich, but you can do what you want. I’m not your mother. Slice up some bread of your choosing. 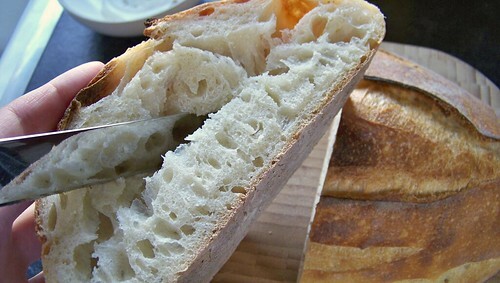 This is a simple ciabatta. 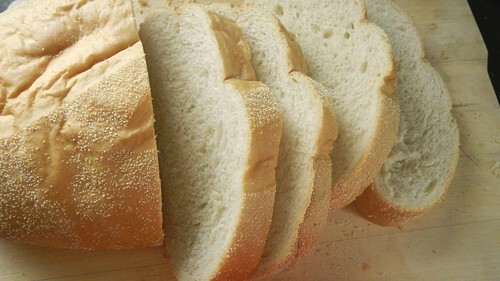 Regular sandwich bread is standard. What is the total BEST though is a nice fresh croissant (it might be my favourite thing ever, especially if you add some gooey Brie to your BALT). Like the BEST. Now you put it together! 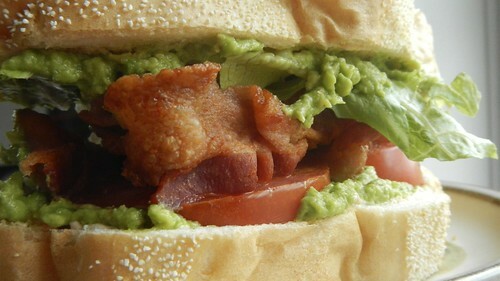 Smear on some spicy mayo and soothing guacamole, then layer on your bacon, lettuce, and tomato and you’re good to go. 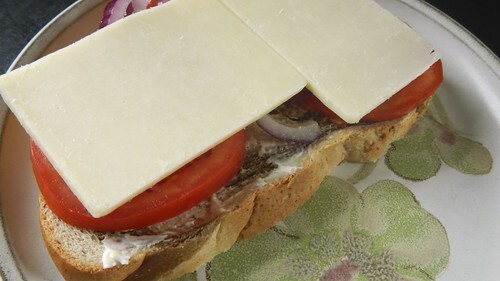 Did you need a DIY on how to make a sandwich? Perhaps not. But I don’t care. Because now I get to eat this. 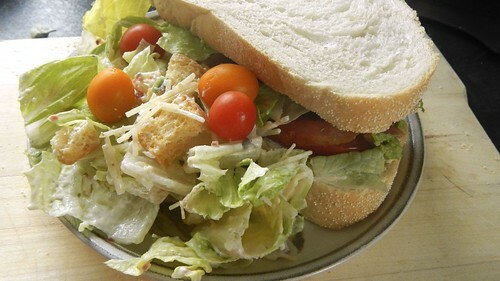 With a salad that is mostly comprised of exactly the same ingredients: lettuce, tomatoes, bacon, and bread. Oh well. I originally had the title written as “pork-stuffed Belgians” but that didn’t seem right somehow. I had a vision of a bunch of people walking around in Bruges with sausages coming out of all their pockets. For the record, the Belgian is the name of the loaf I picked up from the Georgestown Bakery the other day. 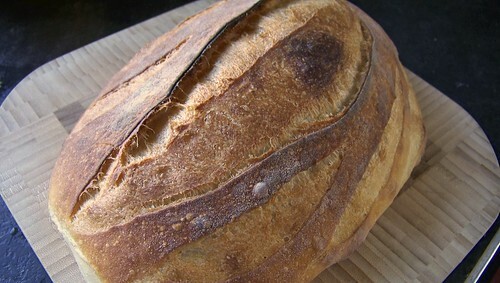 Not to be confused with the sweetened tea bread served in Belgium, this is more of a sourdough French bread baked in a shape not unlike a gridiron football. The thing is, I picked up two, because they were hot from the oven and the guy at the counter was very persuasive. The other thing is, they’re not so good the next day — a little stale. We consumed one for lunch that day, and then I had to think up what to do with the second one for dinner. That’s a lotta bread. So I kind of made this up on the fly. I’m sure there are other variations out there, and if there’s one with a nifty name, please let me know. Also it could use some tweaking so I welcome suggestions. 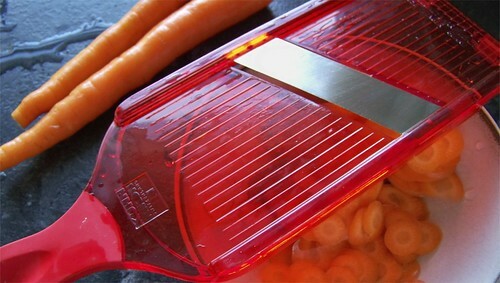 Preheat your oven to 450°F and spray a baking dish. 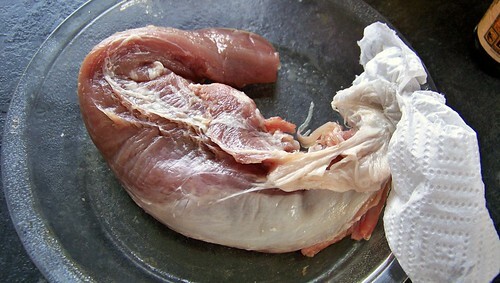 Peel the membrane off one small tenderloin (enough meat for three people), just like we learned. I lightly basted the tenderloin with a few drops of Lee & Perrins Worcestershire Sauce, malt vinegar, and hoisin sauce. Pop that sucker in the oven for about 25 minutes, or until the meat reaches an internal temperature of at least 135°F (for rare). 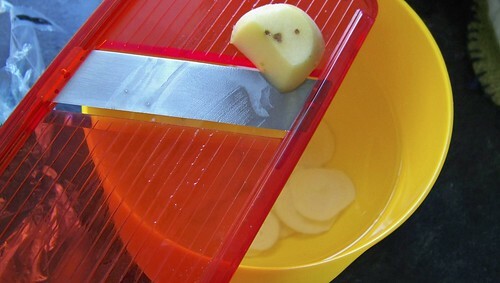 Meanwhile, use a mandolin to thinly slice about four small new potatoes. 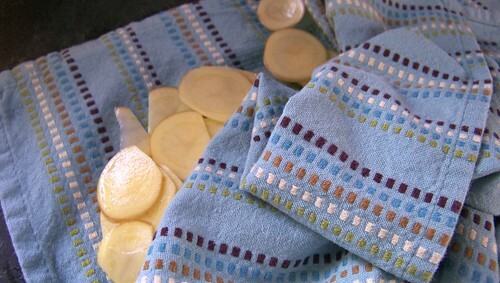 I sliced them into a bowl of water, to rinse the starch off. Drain the water and pat the potatoes dry. 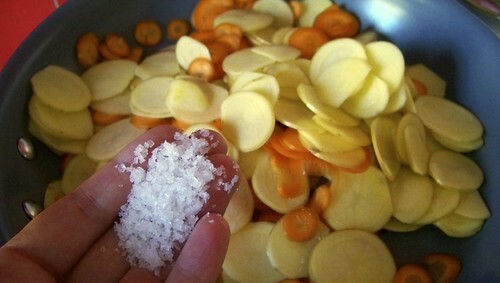 Thinly slice as well three small carrots. We’re working with small today. 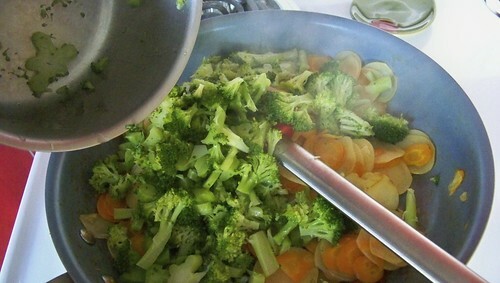 Chop a few broccoli florets up and steam them. Toss the potatoes and carrots into a large frying pan with a bit of olive oil and sauté on medium-high heat for a few minutes. Add in some sea salt to taste. 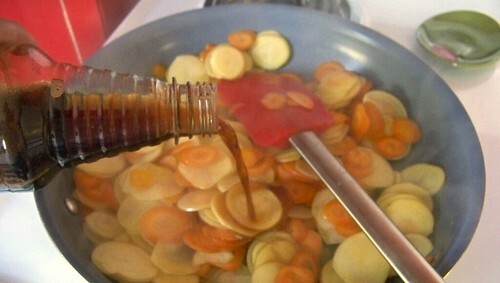 Add in about three tablespoons malt vinegar and three tablespoons water and reduce the heat to medium-low until the vegetables are tender. 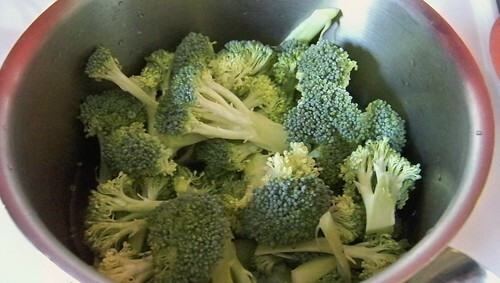 Plop in your steamed broccoli bits. 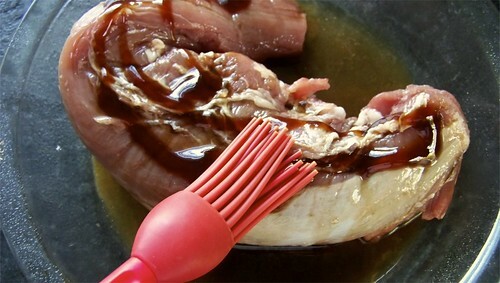 Plop in a few spoonfuls of plum sauce and teriyaki sauce. 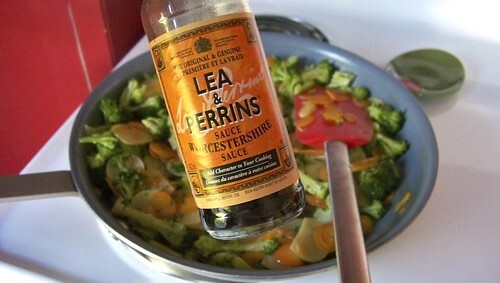 Don’t forget another splash of the wooster sauce as well. 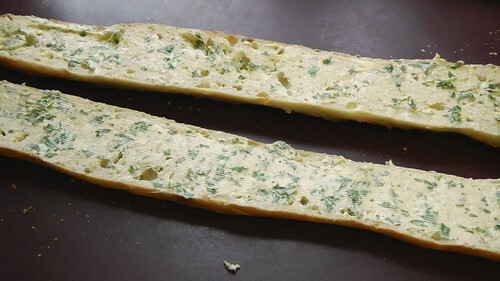 Now cut your loaf (I used a Belgian, but you might want to try something with a little less bread in it) in half vertically. Slice a hole in each half, being careful not to puncture the sides of the loaf. We want a little pocket. 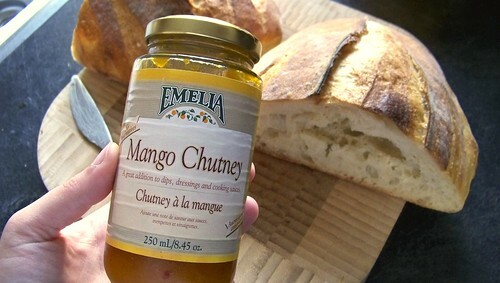 I thought we needed a bit more sweet in this salty meal so I spread the inside of the pocket with some lovely mango chutney as well. At this point your tenderloin should be cooked. 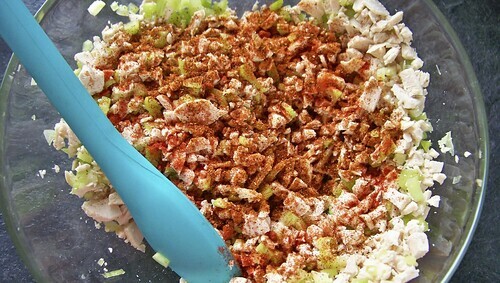 Plop it on a board and cut it up without allowing the meat to rest. We want the juices to run so they run straight into the bread. Stuff pieces of the tenderloin into the pocket. 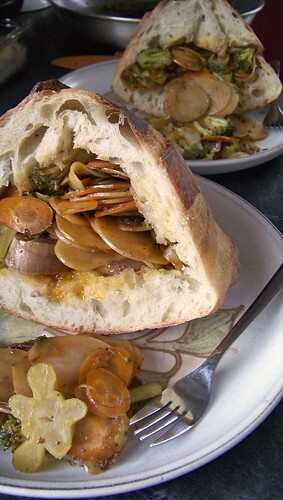 Stuff your warm vegetables in as well. 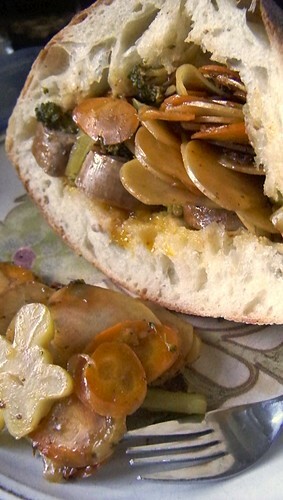 I had plenty of vegetables left over, and some meat, and that made a good lunch the next day. 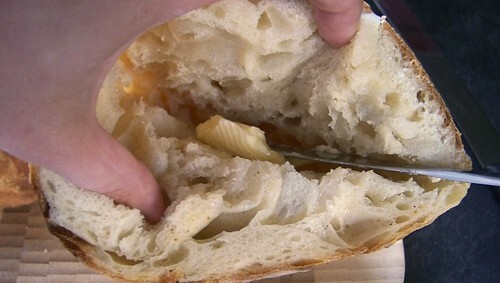 I never want to see bread again. When the Pie and I first started dating, we both had a lot more money than we do now (read: we have NO money now, and then we HAD money). So we used to go on these elaborate dates, which were so much fun. On this one in particular, it was my turn to plan. We started out picking raspberries from a local farm (where I got bitten by a dog and I still have the scar, seven years later, but that’s another story), followed by a picnic lunch in a village park, a game of mini-golf (where I soundly beat the pants off the Pie), a nap, and then a late dinner at a fancy restaurant downtown. A good time was had by all. But this story is about the picnic. As I said, we had only been dating a few months, and I wasn’t yet fully versed on the Pie’s various food likes and dislikes (he insists he’s not a picky eater, but the rest of us look at each other and shake our heads). 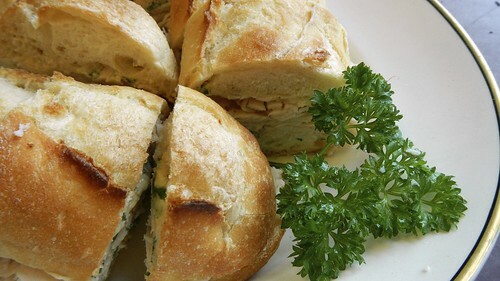 To impress my new man, I had prepared a sumptuous picnic feast, featuring as a main course my signature chicken salad sandwiches with moist, tender chicken, crisp celery, and just a hint of spice. 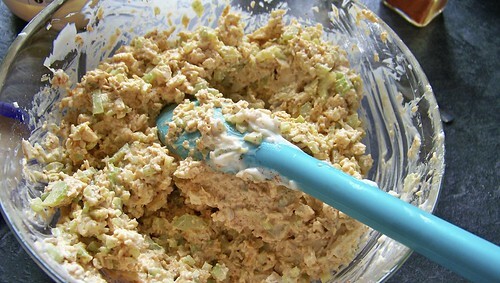 It turns out that the Pie didn’t like chicken salad. Note that I said “didn’t.” He gallantly took a bite of the sandwich, to be polite (after all, I had made him two sandwiches in anticipation of his appetite). Instantly, he was converted. Now he gets chicken salad all the time when he buys sandwiches. So here is that recipe for you. Go forth and proselytize! 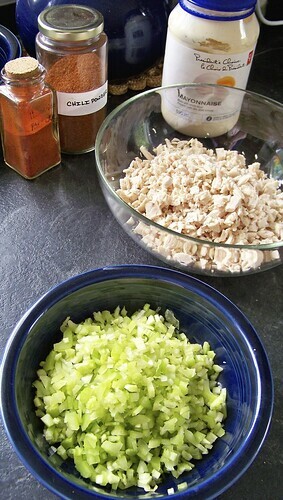 We had 2 boneless, skinless chicken breasts that we’d poached the day before. 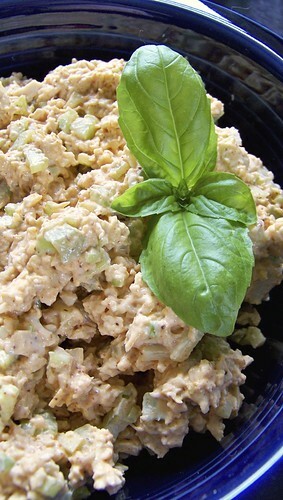 The trick with chicken salad is to mince your chicken. 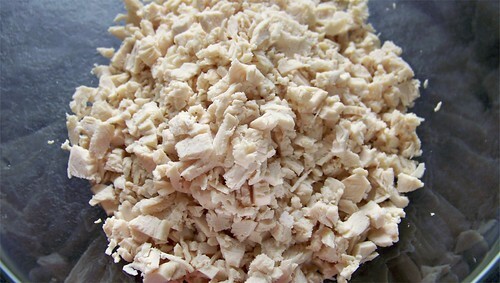 Most chicken salads have these huge chunks of chicken in them, which, while tasty, tend to fall out of your sandwich all over the place. 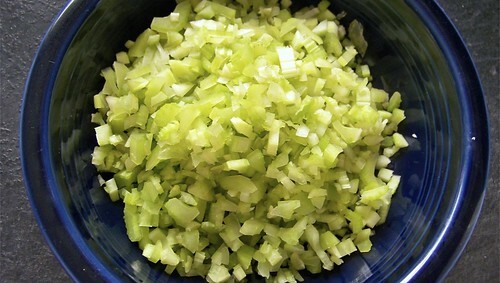 Also mince up a few stalks of celery. 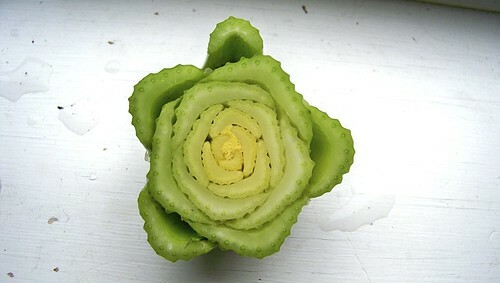 I like the bottom of celery bits. It’s like a green flower. 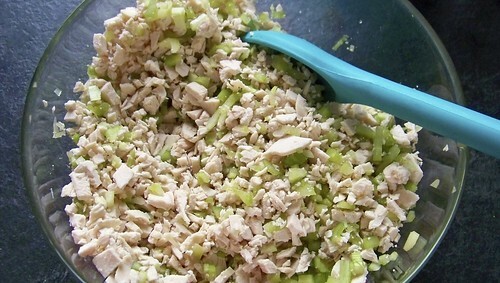 Mix the celery into the chicken. 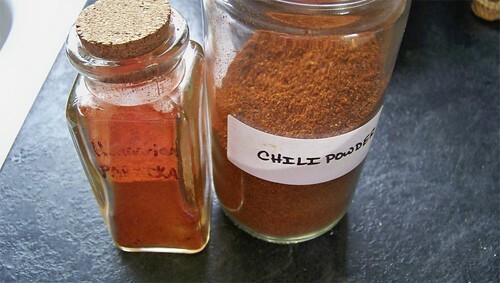 Now add about a teaspoon of paprika, and 2 teaspoons chili powder. You can add more if you like the taste. 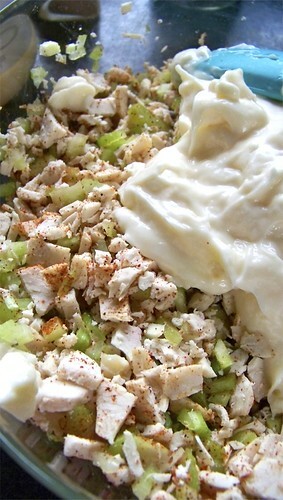 Glop on about 2/3 cup mayonnaise (don’t skimp here, people, and use real mayo). Mix that stuff up. 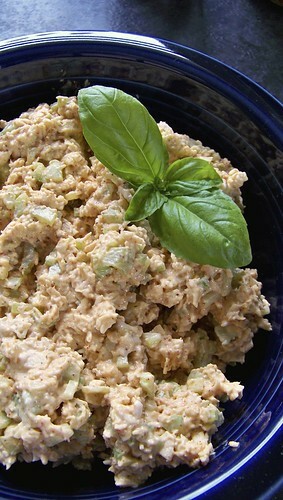 Garnish with a festive sprig of basil and you have yourself some salad. 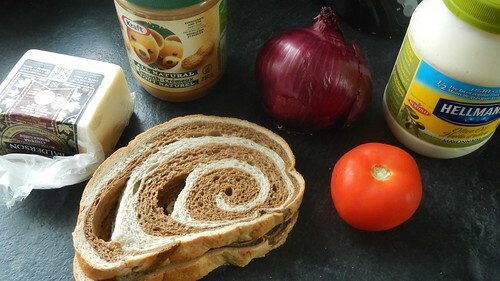 Which you can then put into sammiches. Which you can then eat. Have you ever converted anyone to a food?